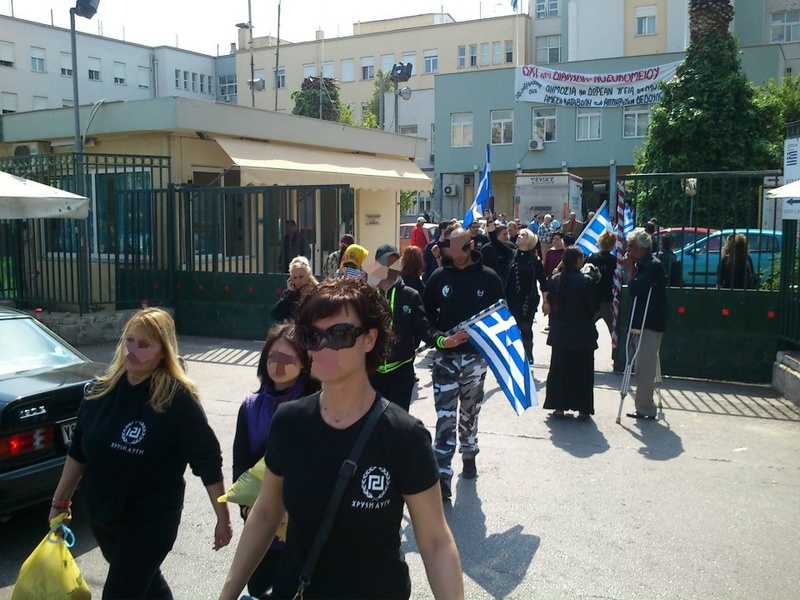 Yesterday, on April 29th, comrades from the whole district of Piraeus completed a big informative campaign and political action on banks of the area. The purpose of the march was to inform the People of the usurious tactics the banks employ these days, as well as to make them aware of the plans of the Zionists. Another successful Social Solidarity action was completed yesterday, under the guide of the National People's Front, Golden Dawn's sister organization in Cyprus. The event was organized to provide relief to the families that were stricken by this crisis and were left alone to face it. The comrades, after a lot of hard work, managed to gather large quantities of food and other basic necessities to distribute to the Greek Cypriot families. Nine months ago, the leader of the Main Opposition party, Alexis Tsipras, advertised to the Greek People that his party would organize structures of solidarity to aid the working class (in an attempt to copy Golden Dawn's Social Solidarity Program that was active, even at a smaller scale, for many years) and those that activism would be funded by the paychecks of their MPs. Those MPs projected their philanthropy on the TVs and the radios in a publicity stunt to touch the hearts of the voters. But it turns out that with idle words they were only make-believe heroes. That's because information reveals that the grand plan of solidarity wasn't so popular with the wallets of the MPs in question. They developed a separate antisocial movement within their movement. Other MPs of SYRIZA reported their comrades on their stance, as they have the responsibility to abide by the collective decisions. 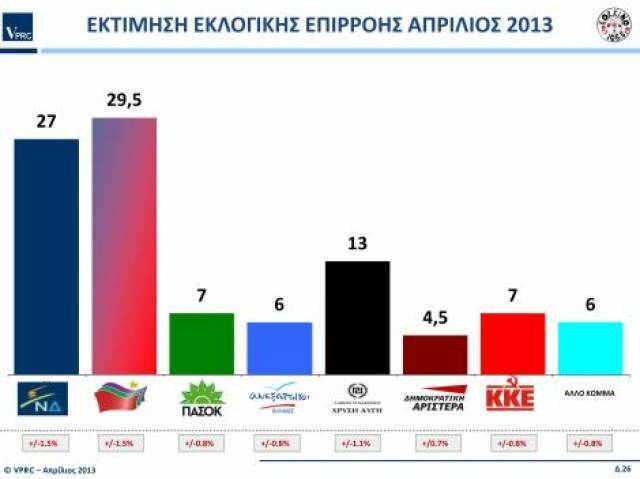 Even SYRIZA can't hide the unstoppable rise of the Social Nationalist Movement. This is the explanation we can come up with after the new poll of VPRC in account of SYRIZA's radio station "To the Red". 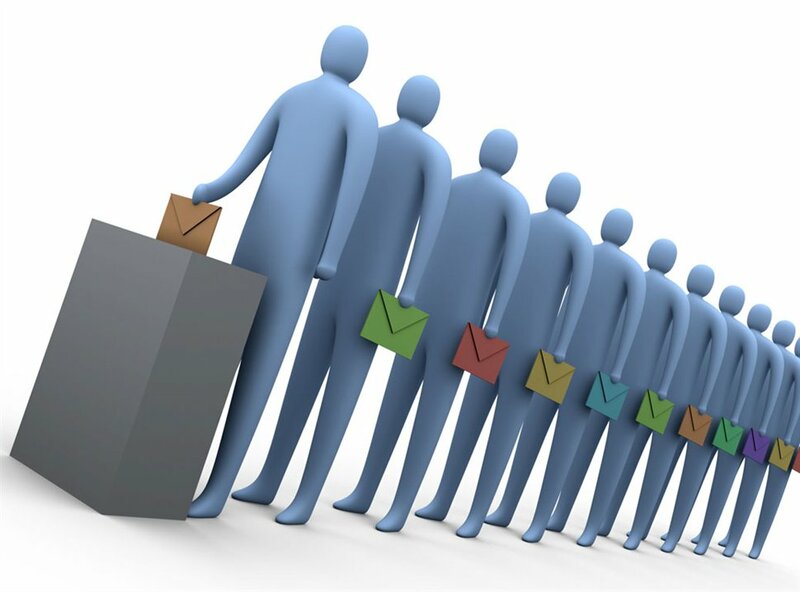 We are aware that political customers of the gallop companies can slightly alter the image of each poll, as seen on the election of 2012 where polls showed that GD would earn a 3% of the vote. The truth was vastly different, of course. This practice tends to become a tradition. A statement of a Party member regarding eugenics was a one more statement the lying Media would distort just to produce even more propaganda against the Movement. The Media consensus was that, if she ever rose to power, Golden Dawn would... exterminate our handicapped compatriots! 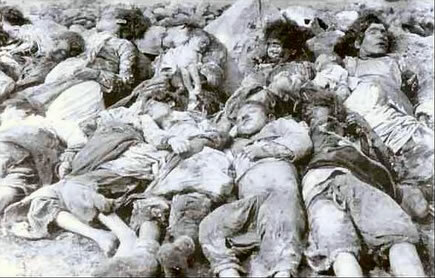 Read about the genocide here. Today, early this morning, a team of comrades from the organization of the area of Perama, leaded by the organization's secretary, was the star of an intervention of the offices of the Public Water Company. The comrades, after the calls of our compatriots, prevented the Company's crew from cutting off the water supply of certain families, even though they had declared that they were unable to pay the bill. 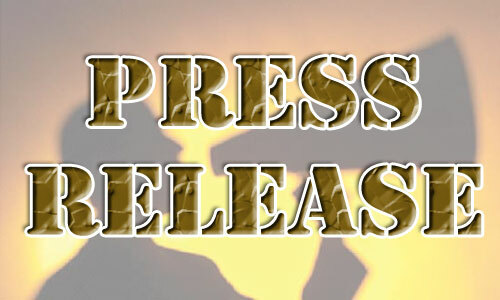 Golden Dawn condemns the perpetrators of the incidents at Manolada and the shootings against the foreigners. She also condemns those that employ illegal immigrants, depriving a living from thousands Greek families. The rotten political regime that drove the country to this dreadful situation, with millions of illegal immigrants flooding the nation, is completely responsible for the events at Manolada. All those people that brought the foreigners here and tolerated their black employment and exploitation should not pretend to be touched by those events. Politicians of the Left and the Right, supposedly "humanists", share responsibility for both the slave trade and the huge problems foreigners cause against the Greek People. Only Golden Dawn has a clear solution for this: Deportation of all illegal immigrants! A definitive end to the black labor of the immigrants! Read more for the commentary. Golden Dawn everywhere! Regional Organizations all over the world. 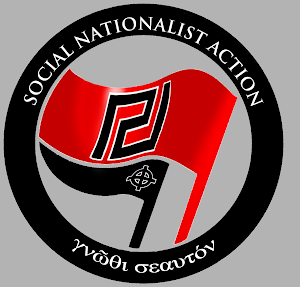 The People's Association of Golden Dawn, the movement of the Greek Social Nationalists, has the support of millions all over the world. Despite the mudslinging and the terrorist attacks we have faced and keep facing, supporters and friends of the Movement are spreading Social Nationalism and Hellenism with Regional Organizations everywhere, the first of them popping up wherever the Greek Diaspora can be found, in New York , Melbourne and Montreal! 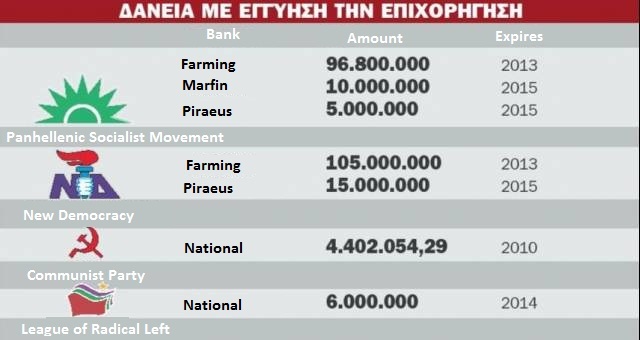 Loans of political parties in Greece. Note the Communists. The amendment of shame, introduced by 3 MPs of the "Patriotic Right", that will be validated tomorrow is the tombstone of the current political system. The Golden Dawn reveals how the parliamentary agents of New Democracy, with an amendment that leaves a window open and offers immunity for the parties that owe hundreds of millions of euros to the banks, the majority of which belong to the Public Sector, therefore it offers immunity for the thieves of the People's wealth. 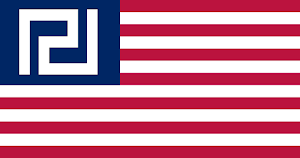 The law is with us regarding the issue of the forced occupational loan of 1942, according to a classified document and a report from the Honorary Vice President of the High Court of Athens, which proves that National Socialist Germany was in the process of paying back the loan. Yet another poll shows what the Zionist slaves don't want to see and try to fight. 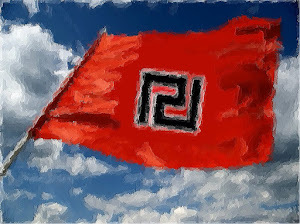 The continuous and unstoppable rise of the Golden Dawn is something many try to hide, but it has started becoming unbearable or, like the Judo-Romanian finance minister of France said, "intolerable". Below we can see statistics that reflect the Greek Society. 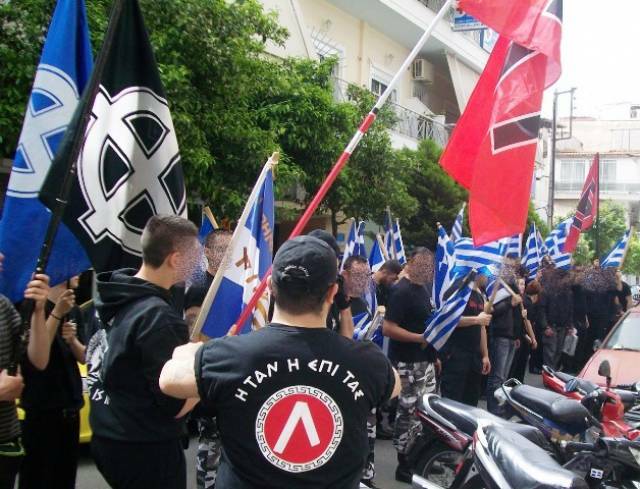 Golden Dawn is the only growing political force of this country, and every other slowly deteriorates. 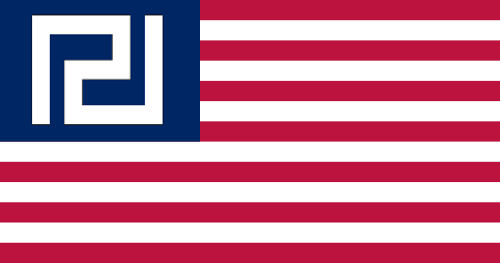 The existing, flimsy political system in collaboration with the media of mass deception, having nothing else to criticize Golden Dawn for, have devised a series of not just baseless and ridiculous accusations, but you could say accusations that transcend the boundaries of Hollywood science fiction. Among the titles "werewolves", "satanists", "vampires", "killers" as we have been called, they added the characterization of "misogynists". This surreal accusation, however, has nothing to do with the actual role of women in nationalism. Learn about the ecological activism of our movement, as it was never shown by the lying Media. 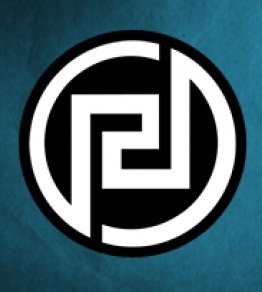 Don't forget to use the new feature of the Golden Dawn Gallery and see what we are fighting for with your own eyes. A picture is worth a thousand words after all. The Militia Guard of the Golden Dawn Central Command on Mesogion Str spotted an apartment that had caught fire. Immediately the comrades rushed to aid the people living there and put out the fire before the Fire Brigade even arrived, eliminating any danger for the residents of the building and their neighbors. The latest addition to the Newsroom, an easy way to view all of Golden Dawn-related media. For now this feature is limited to images and later we may include videos covering the action of Golden Dawn - without the propaganda of the mass-liars. 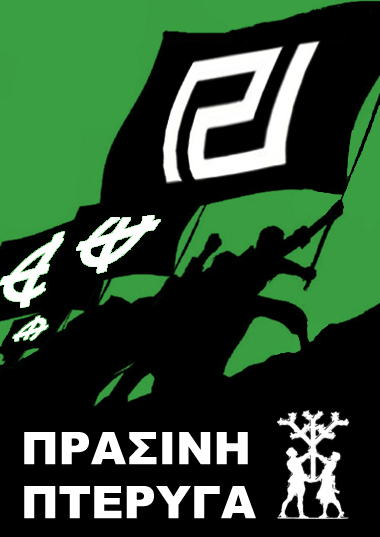 We will upload more pictures related to Golden Dawn, old and new alike, covering marches, activism, meetings and our posters. For now, take a glimpse of pictures related to the next post of the Newsroom - a publication regarding the Green Wing, the ecological organization of the Movement and a very special project it has undertaken - more images will be uploaded soon!